We are woken by the cheerful sound of the birds along with the sun daring you to challenge for yet another day of rapids. 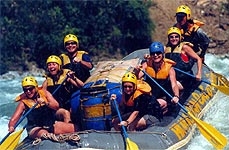 After a hearty breakfast prepared by our staffs, we start rafting. We paddle through the high and lows of the rapids and stop in between to scout the rapids as well as to capture these beautiful moments on pictures. We stop for a leisurely lunch break around the middle of the day along the sandy beach of the river. We explore the various temples and villages, waterfalls and other interesting sights. The length of time spent rafting each day depends on our choice of spectacular campsites. Typically we are on the water for 4-6 hours. Camping on isolated sweeping white sandy beaches and sleeping in tents under the stars and open sky is an ideal introduction to the great outdoors. 1. Always follow what the river guide tells you and respect his judgements. 2. Valuables of any nature should be left at the hotel. 3. Shorts, T-shirts, comfortable shoes and a spare pair of clothes to change, sun creams, sun hats and sun glasses, which can be tied at the back, are recommended. Gifted with a multitude of rivers that that are perennially fed by the Himalayas, Nepal is one of the richest countries in water resources. In recent years avid river runners have taken notice of the true potential of the Himalayan river and within a short span of time it is earning a reputation as one of the best places in the world for white water rafting. Though only ten rivers have been opened by the Government for commercial rafting, Nepal offers a unique opportunity for all to taste the thrill of whitewater rafting. There is something for everyone - slow moving rivers with idyllic sand beaches ideal for relaxation to high action big volume rapids that has your adrenaline pumping. Spectacular scenery, rich culture and spectacular rivers make the trip gratifying.